Rotel A14 review | What Hi-Fi? Rotel is like the friend you can rely on to have everything in your time of need – plasters, Paracetamol, an elastic band. The exhaustive functionality of its previous few models has been impressive to say the least, and the A14 – the flagship integrated amplifier in the brand’s new 14 series – is just as well equipped for today’s gluttonous buyer. 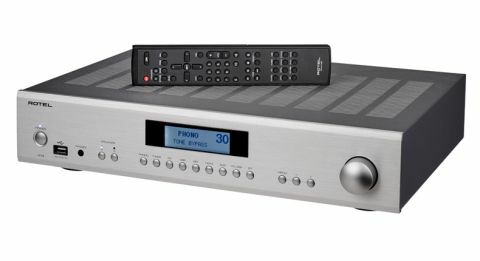 A moving-magnet phono stage taps into the vinyl renaissance, aptX Bluetooth caters for smartphone streaming, and a 32-bit/768kHz DAC aids myriad digital inputs to welcome your streamer or CD player. Two optical and coaxial inputs apiece, compatible with hi-res files up to 24-bit/192kHz, join a type-A USB port for iOS devices (and a second solely for charging devices), as well as a type-B USB for playback from a laptop or PC. The latter handles DSD 64 and 128 and is compatible with ‘class 1’ (restricted at 24-bit/96kHz) and ‘class 2’ (supports 32-bit/384Hz) USB interfaces, so if you have the former, be sure to switch to class 2 in the amp’s menu. Four line-level inputs and a 3.5mm headphone jack complete the bill. You’ll spot an ethernet socket on the rear panel, but don’t get your hopes up – it’s simply there for software updates rather than facilitating any network streaming. Each input has its own dedicated button underneath the LED display screen, making it quick to switch between them. That means the façade of the full-width chassis (available in silver and black) is busy, but that design technique is fairly close to home for Rotel, which has created a traditional aesthetic that’s still polished enough to look like it belongs to the 21st century. The trend extends to the black remote, which is traditionally tall – thankfully, a million miles from the common modern credit-card style tool – and generously populated. Even outputs exceed expectations thanks to a second pair of speaker terminals for hooking up – you guessed it – a second pair of speakers. A preamp output means you can add extra horsepower by way of an additional power amp down the line. We put emphasis on that last part because you won’t be rushing out to buy one. The A14 gives every impression of its 160W output (20W per channel more than the A12 it sits above), with a powerful, authoritative sound. Its emphatic delivery of Kendrick Lamar’s King Kunta showcases its athleticism, driving it forward and throwing conviction behind the rap. It allows the intentionally prickly production to come through, but also has the refinement and balance to ensure it isn’t uncomfortably overstated. The A14’s soundstage is far less prone to congestion than its trunk-road namesake, demonstrating fine instrument separation and spaciousness. The funky walking bassline that underpins the tempo for the track’s lyrical structure has heft aplenty, even if we feel it could shimmy along quicker. The treble’s thin character is a little more noticeable, the scratchy synths opening The Naked and Famous’ Young Blood coming through a little zingy. That’s only emphasised as we switch from line-level to the PC-USB input, which suffers from a slight loss of warmth and weight in comparison, but is a decent alternative when it comes to detail and precision – especially for playing hi-res tracks. Given the choice, we’d hand our hi-res collection to the coaxial input. The beautiful piano sequence of Ludovico Einaudi’s Oltremare glides along just fine, the A14 confident in its footing of notes. Each comes through with substance and authority, although without the delicate touch and dynamic subtlety of some of its peers, namely the Rega Elex-R (£900), it’s not quite as intimate as it should be. It soon becomes clear that although the Rotel has what it takes to draw you in, it doesn’t necessarily have the talent to keep you there. The Rega takes it for rhythmic articulacy and ultimate transparency too, better conveying the playful rhythmic framework of Michael Jackson’s Stranger in Moscow, while offering a wider window into Jackson’s soulful vocal and greater texture to the pitter-pattering sound of rain. Play Badly Drawn Boy’s Stone on the Water and occasionally notes that have purpose through the Rega roam stray through the Rotel. The Rotel A14 has its strengths: an impressive connection count and bold, authoritative sound. But without the transparency and rhythmic dexterity of more affordable class leaders, it can’t be hailed one of the more illustrious stereo amps of Rotel’s 55-year career. Not even close.